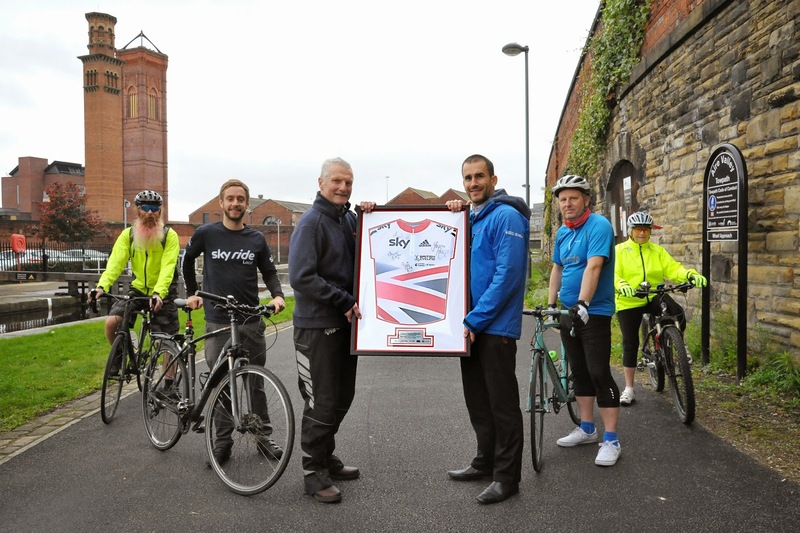 Leeds City Council was this week presented with a signed Great Britain jersey in recognition of a highly successful and special year of partnership with British Cycling. The framed jersey was presented by British Cycling’s Recreation Manager for Yorkshire Dan Goodey to the council’s cycling champion Councillor Roger Harington in honour of a year which has seen the number of people taking part in managed rides in Leeds through the Sky Ride programme rise. The city also hosted another successful mass-participation city centre Sky Ride event in June as well as the globally-admired Grand Départ of the Tour de France in July. The jersey has been signed by Great Britain’s all-conquering Olympic and world champion women’s team pursuit riders Joanna Rowsell, Laura Trott and Dani King as well as Elinor Barker, who has been part of the team for their last two world title successes. Joanna Rowsell made a personal appearance in Leeds this June, being guest of honour at the second annual city centre Sky Ride event which despite poor weather attracted over 8,500 people to take to traffic-free streets and attracted more than double the number of pre-event registrations than last year. The number of children and young people under-16 taking part in Sky Ride Leeds this year was 33 per cent compared to 28 per cent last year, while the percentage of women and girls taking part in managed events and rides in the city rose from 43 per cent to 45 per cent this year. The partnership continues to grow, with more Sky Ride Local and women-only Breeze rides on offer, while the numbers of British Cycling Ride Leaders and Breeze champions are also increasing. Leeds City Council and British Cycling also worked closely together on the planning and delivery of the historic Grand Départ of the Tour de France in July, which attracted hundreds of thousands of people to the city to watch the start of the race and drew worldwide admiration for its success. Before the start of the event the Ride Leaders enjoyed a once-in-a-lifetime experience, as they led the stars of the Tour along the route of the official riders’ parade, cheered on by an estimated 12,000 people as the teams made their way to the Leeds Arena for the opening ceremony. On race day itself, a group of promising young cadet riders selected by British Cycling and Leeds City Council were given the chance to ride the race route start and finish ahead of the peloton. British Cycling were also involved in the official Grand Départ Spectator Hub at Scott Hall, which saw crowds of 12,000 people watch the race and take part in a range of family activities including a Go Ride Race for under-16s. The signed jersey is now on public show in the Civic Hall ante-chamber joining the display celebrating the success of the Grand Départ as well as the legendary Morley cyclist Beryl Burton OBE, who was posthumously awarded the Freedom of the City of Leeds in September. “We are delighted and grateful to British Cycling for this signed jersey to commemorate a really special year of partnership. It is especially fitting that it is signed by our young female Olympic and world champion stars in a year when as a city we honoured Beryl Burton and continue to encourage more women and girls to take up cycling. They can have no better inspiration than Beryl Burton and the stars of today. “We enjoyed a summer like no other in Britain, from the Tour de France to the Tour of Britain, as well as supporting our heroes at the Commonwealth Games. It’s a great time to be inspired by cycling and we’ve really enjoyed working with Leeds City Council to get more people on more bikes than ever before. In the last five years of British Cycling’s partnership with Sky, more and more people in Britain have been getting into cycling regularly – more than one million now cycle once a month. To find out about more opportunities to ride your bike in Leeds, visit goskyride.com. British Cycling and Sky have come together to help get even more people riding their bikes and falling in love with cycling. However you ride, we've created a whole range of ways for you to get involved – from big traffic-free events, to local guided rides; from women-only rides and support, to tips, ideas and great routes. In 2012 we achieved our joint goal (a year early) of getting one million more Britons on their bikes and cycling regularly (once a month) by 2013. Sky Ride Locals are free, local bike rides guided by friendly British Cycling trained Ride Leaders along scenic planned routes. With different levels, there’s something for everyone – whether you’re building your confidence or already comfortable on a bike and looking for a challenge. For more information, visit goskyride.com. British Cycling is the national governing body for cycling as recognised by the UCI – the international federation for the sport. Based in Manchester at the National Cycling Centre, British Cycling works across all levels and six disciplines of the sport (BMX, Mountain Bike, Cyclo-Cross, Road, Track and Cycle Speedway), from providing the support and encouragement people need to get riding their bikes for the first time, to being home to the hugely successful Great Britain Cycling Team. Continued success at the highest level is inspiring a boom in participation across the nation. There have never been more opportunities to ride a bike, be it for fun or sport, and British Cycling is at the heart of this growth. For more information, visit britishcycling.org.uk.